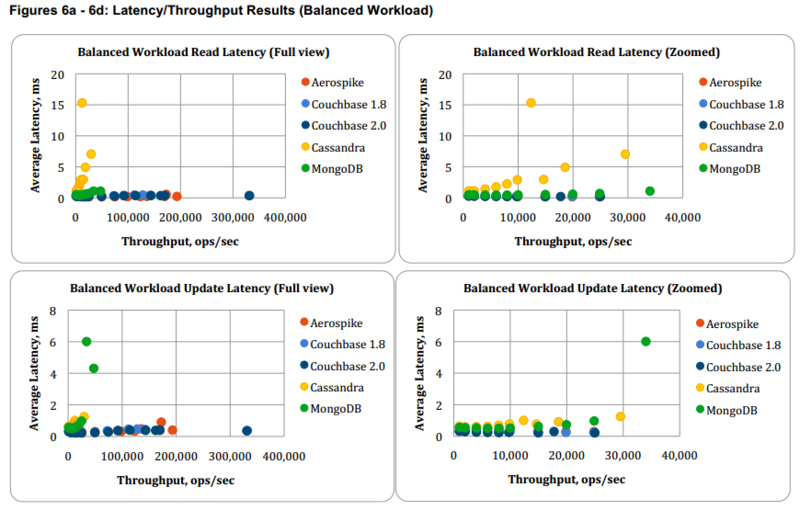 A recent set of benchmarks compares Aerospike, Cassandra, Couchbase and MongoDB to see how they fare when it comes to insert throughput, maximum throughput, latency and behavior during a failover. Thumbtack used an improved version of Yahoo! Cloud Serving Benchmark (YCSB) one that is supposed to overcome some limitations reached when using very high volumes and multiple clients. The YCSB changes have been documented in the first whitepaper and committed back to the community. The NoSQL databases tested were Aerospike, Cassandra, Couchbase (1.8 and 2.0), and MongoDB. The first is a commercial product, and the last is a document data store not a key-value store, but it was included because “in our experience clients often consider it for similar kinds of applications.” All databases were optimized using recommendations from the vendors backing them. 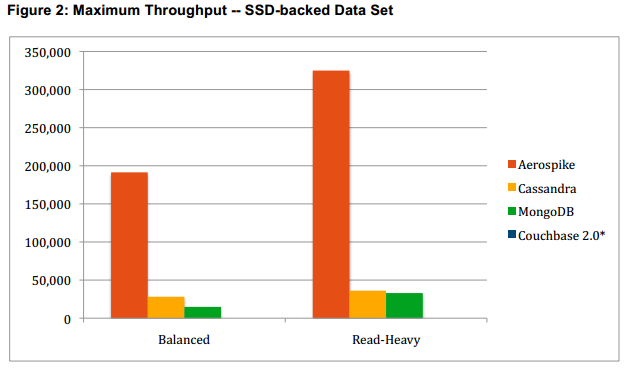 The test systems used SSD storage rather than rotating disks. The whitepapers contain detailed information regarding the methodology used, the client and workload configuration, the hardware configuration, etc. Thumbtack acknowledged having “strategic and/or commercial relationships with Aerospike, Couchbase, and 10gen” and the hardware used was rented from Aerospike. We are including some of the results of the benchmarks. The databases were loaded with initial working sets using YCSB’s loading routing which performs a number of inserts. 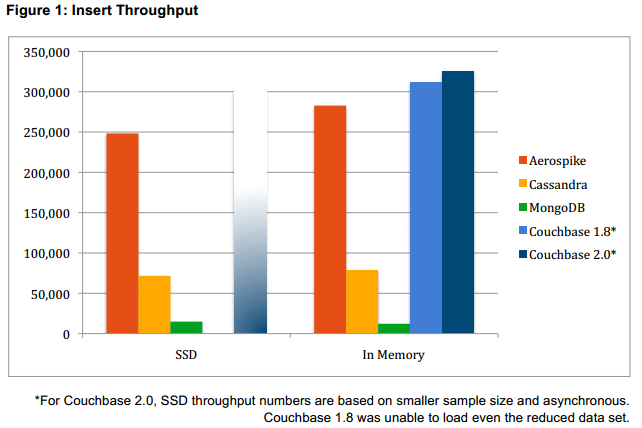 Couchbase had good results when the working sets were loaded into memory, but it had problems loading on SSD when Couchbase 1.8 did not finish the operation and a smaller set and asynchronous mode had to be used for Couchbase 2.0. That explains the gradient blue used for it. Aerospike came second. Couchbase does not appear on the graphic because it could not complete the test using synchronous replication. The Thumbtack benchmarks contains more results for different cases but were not included here. 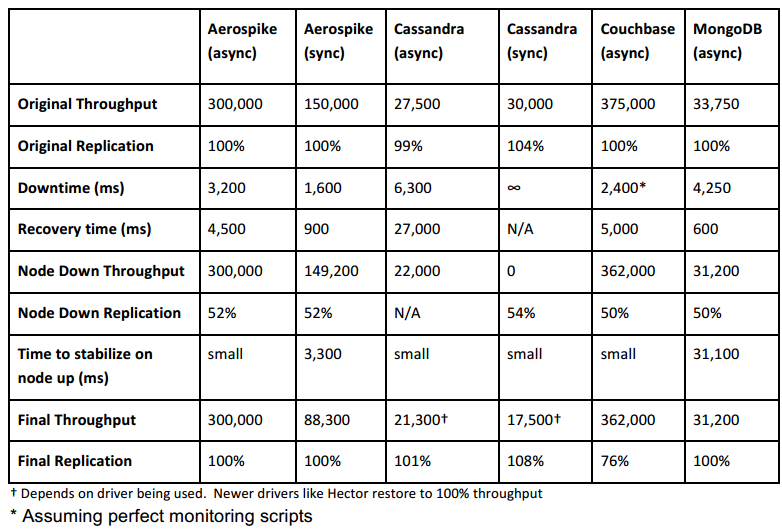 Another NoSQL benchmark was published in October 2012 when Cassandra, HBase, MongoDB, and Riak were compared. MySQL was also included in those tests for a reference against SQL technologies. The summary is interesting. Having spent the last few years studying the source code of several NoSql databases, comparing simple Key/Value, Column Family and Document databases doesn't make sense to me. Even if some use cases can use either type of NoSql database, it's missing some important details. Simple Key/Value databases are not well suited to time series data, nor is document database. The design of the key has a significant impact on query performance. Storing everything as JSON works for some use cases, but many cases it's totally not appropriate. Hopefully readers will take time to understand the differences and not jump to irrational conclusions not supported by these benchmark results. > Thumbtack acknowledged having “strategic and/or commercial relationships with Aerospike, Couchbase, and 10gen” and the hardware used was rented from Aerospike. I'm a nosql newb, but it does seem a coincidence that the one product I've never heard of wins this when the testing company stands to gain if more people adopt Aerospike. No conflict of interest here at all is there? You guys shouldn't have published this. It makes you look bad. This is par for the course in our industry. It is always to be skeptical of benchmarks. The best benchmark is the one you do yourself on your own equipment. But, Thumbtack is an *integrator* -- so they use all the products they evaluate for their customers. Notice they disclosed relationships with ALL the vendors. But their results did not state that ALL the vendors were the best. If they were truly biased they would have declared a three-way tie between Aerospike, Couchbase and MongoDB (10gen). In fact, they dinged Couchbase pretty hard in spite of the fact that they have a relationship with them! So, I am not sure we should slam them for just being honest. Is Thumbtack just being honest or do they earn more money promoting Aerospike vs Couchbase? Benchmarks made by people with conflict of interest shouldn't be published. I can't help noticing that the top performers exceed the performance of maximum sequential write throughput of an average SSD, and the bottom performers are below the random IO performance of an average SSD. What SSD was used? 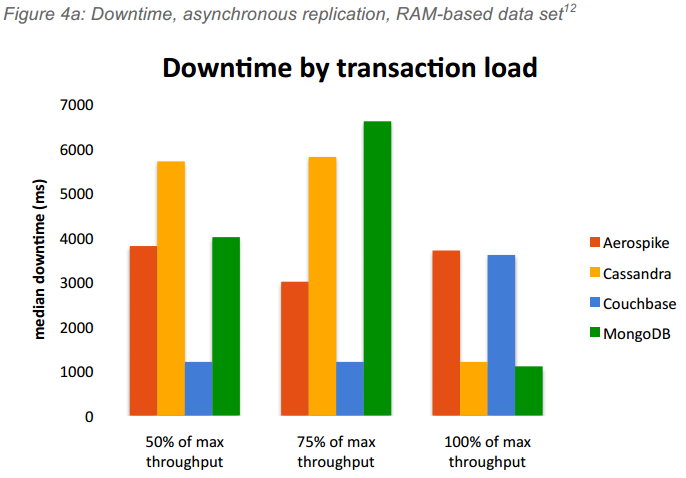 Was all the data persisted in the insert workload or is this a test around which datastore can buffer data in-memory the fastest? 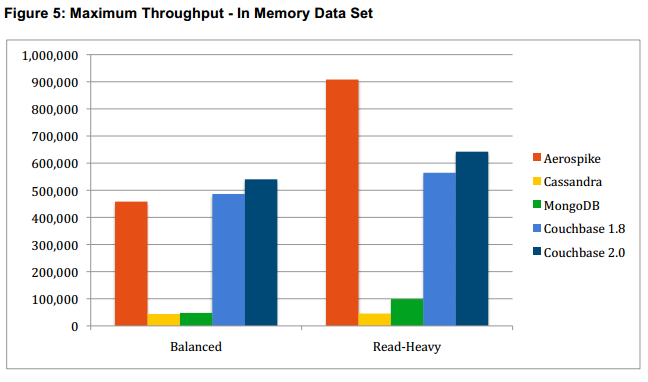 Please, could you add Hyperdex, MonetDB and Redis to your benchmarks?